The Mining Injustice Solidarity Network (MISN) and Save the Scenic Santa Ritas are thrilled to present the Toronto premiere of a new film chronicling the impacts of – and powerful resistance to – Toronto-based company Hudbay Minerals’ mining operations in Guatemala, Peru, northern Manitoba, and Arizona. The film’s director, John Dougherty, will answer questions after the screening, and MISN will also provide an opportunity for audience members to take action in solidarity with the communities depicted in the film. This is a free screening at the beautiful Royal Cinema. Please invite your friends, family, and colleagues! Unfortunately, while the theatre is wheelchair accessible, the washrooms at the Royal are not. MISN has been working in solidarity with communities impacted by Hudbay Minerals for 6+ years. More info on this activism here. 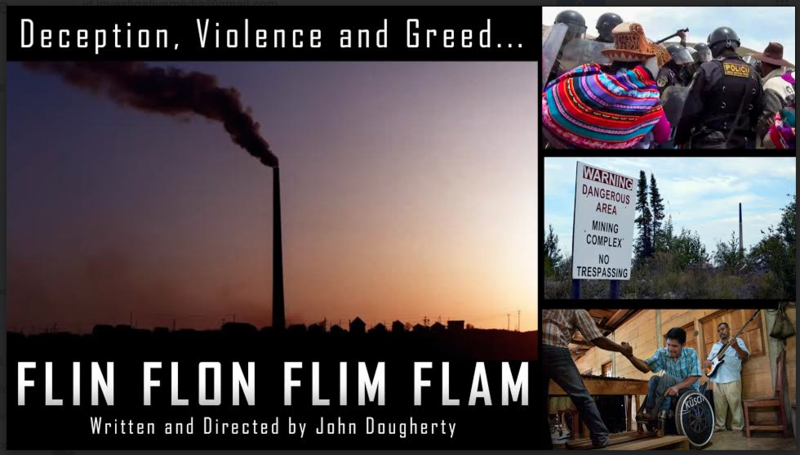 In the wake of the New York Times’ April front-page story on Hudbay Minerals’ alleged human rights abuses in Guatemala that triggered calls for national mining reform, Arizona investigative journalist John Dougherty presents his unflinching exposé on Hudbay’s worldwide operations in the documentary “Flin Flon Flim Flam”. In September 2014, Mr. Dougherty traveled to Guatemala where he interviewed the same victims and survivors that appear in the Times story. Hudbay stands accused in a Toronto civil trial of a series of atrocities that left a prominent Mayan community leader hacked and shot to death, 11 women alleging they were gang raped by mine security personnel and a young father paralyzed from a shooting during a community protest. Two months later, Mr. Dougherty was at Hudbay’s Constancia Mine in Peru soon after demonstrators were beaten and teargased by police during a community protest. The film also documents Hudbay’s long history of environmental contamination in Flin Flon and its clashes with a First Nation. In Arizona, Hudbay plans to build a massive open-pit copper mine in a “Sky Island” with a dozen endangered species, including the only known wild jaguar in the U.S.